Authorities in Afghanistan said Saturday national security forces and U.S. drone strikes have jointly killed at least 28 Islamic State (IS) fighters in a restive eastern region bordering Pakistan. The overnight attacks happened in Achin and Kot districts of the province of Nangarhar, said local officials. Achin’s chief, Haji Ghalib, told VOA 16 Daesh (Arabic acronym for IS) militants were killed when missiles fired by unmanned American aircraft struck a vehicle and a gathering of the group in a remote part of the mountainous district. He identified the dead as Pakistani militants. Separately, provincial officials say Afghan security forces in the nearby Kot district killed 12 IS fighters and wounded several others in overnight clashes. They say two civilians caught in the crossfire were also killed. A U.S. military spokesman, Colonel Michael Lawhorn, confirmed American forces conducted a counter-terrorism strike in the Achin district Friday. "For operational security, we will not discuss the details of this event," he told VOA. Achin is where Afghan authorities say Islamic State has established its stronghold for attacks in and around Nangarhar. In recent weeks, the U.S. has carried out frequent airstrikes in the province and used drone attacks to destroy an FM radio station broadcasting Islamic State propaganda. The air raids killed 29 militants, including five staff members at the so-called “Voice of Caliphate” broadcast facility. The outgoing commander of U.S. and NATO forces in Afghanistan, General John Campbell, has warned that IS continues to conduct brutal attacks against Afghan civilians. 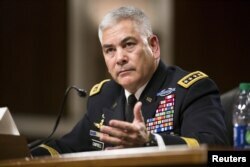 FILE - U.S. Army General John Campbell, commander of the Resolute Support Mission and United States Force - Afghanistan, testifies before a Senate Armed Services Committee hearing on "The Situation in Afghanistan" on Capitol Hill in Washington, Oct. 6, 2015. “They have focused their efforts on establishing a presence in Nangarhar and recruiting in other areas,” General Campbell told the U.S. Senate Armed Services Committee in Washington Thursday. Accelerating the Push Against Islamic State: What Will Work?